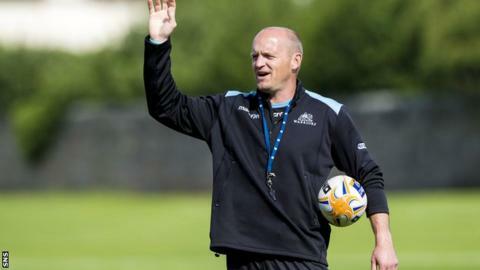 Gregor Townsend says his Glasgow side are reaping the rewards of a rigorous pre-season after seeing them make it three wins from three in the Pro12. Warriors powered to a 33-13 bonus point victory at NG Dragons, despite playing most of the second half with 14 men. "The players have played really well so far this season," Townsend said. "They worked very hard in pre-season and it shows in the last 20 minutes of our last two games that we look fitter and are taking our opportunities." Alex Dunbar scored the visitors' opening try before Tyrone Holmes was sent off for stamping on T Rhys Thomas at the start of the second half, with Glasgow leading 13-3. And despite their numerical disadvantage, Warriors crossed three more times through Josh Strauss, Tommy Seymour and Tim Swinson. "I'm really happy with the character," Townsend told BBC Scotland. "We played pretty well in the first half, not as well as we can, but we built up a good lead. "The red card put us under a bit of pressure but the players responded well - to score three tries in that period would have been a great achievement with 15 players but to do it with 14 really shows that the players are doing all they can to win." The win over Dragons follows triumphs against Cardiff Blues and Leinster as Warriors look to go one better than their runners-up finish in last season's campaign. Next up for Glasgow is a home match on Friday night against Connacht, who have also won their three fixtures so far. "It's a big game now," Townsend added. "We've not had a Friday night at Scotstoun yet this season, we've been on the road the last two weeks, so it will be great to get back home and to play another unbeaten team in the league makes it a fantastic fixture."